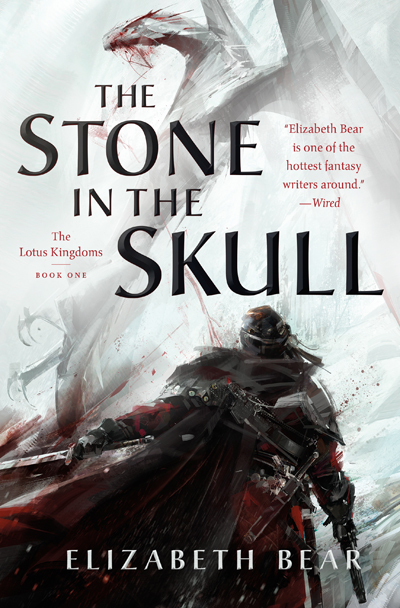 The Stone in the Skull takes readers over the dangerous mountain passes of the Steles of the Sky and south into the Lotus Kingdoms. Elizabeth Bear is an American author who works primarily in speculative fiction genres. She won the 2005 John W. Campbell Award for Best New Writer, the 2008 Hugo Award for Best Short Story for “Tideline”, and the 2009 Hugo Award for Best Novelette for “Shoggoths in Bloom”. She is one of only five writers who have gone on to win multiple Hugo Awards for fiction after winning the John W. Campbell Award for Best New Writer (the others being C. J. Cherryh, Orson Scott Card, Spider Robinson, and Ted Chiang).